Now a days the younger people like yahoo messenger a lot because it provides the facility of chatting with other individuals worldwide including Facebook Friends. In fact it's great to chat online. Facebook is another place where youngsters hang out all the day. Facebook has a online chatting facility which enables to chat with online friends. To chat on both we have to open yahoo messenger and the browser separate to chat on facebook. But now the Yahoo messenger 11 beta provides you with the facility of integrating facebook account right into the messenger. Once you integrate you can chat with your facebook online friend right from the messenger. How to Integrate Facebook into Yahoo messenger. It's very simple. It's just that you have to make some changes in your current messenger. 1. Download or update your yahoo messenger to its newest version 11 beta. 2. Once it's updated you have to link your facebook account to messenger. 3. Now go to Menu and choose Messenger. 4. Now go to preferences and click on it. 5. Once small window opens select the option Connected networks. 6. Now enter your facebook id and password. 7. Now facebook asks for the authentication. Allow it. and you are ready to go. Now just below your friends you can see a section of facebook friends it will show all the online friends of facebook. And you can chat normally as u do it to yahoo friends. It's really great. Isn't it? Best thing is that you can even share your updates to twitter and on facebook. Now you can chat to facebook friends even without opening the facebook. 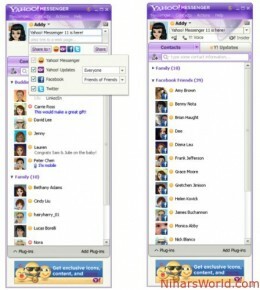 Every time you login into yahoo messenger you can see you facebook friends. So download and integrate facebook account and enjoy chatting to your friends. Just remember it's Yahoo messenger 11 Beta. None other version offers that. wow that's great and i really love this post and i would like to suggest you that you must share this article on the face book.. and on twitter and buy twitter followers and make your blog more populer.. thanks for sharing this stuff..